David Claypoole Johnston was a 19th-century American cartoonist, printmaker, painter and actor from Boston, Massachusetts. He was the first natively trained American to master all the various graphic arts processes of lithography, etching, metal plate engraving, and wood engraving. 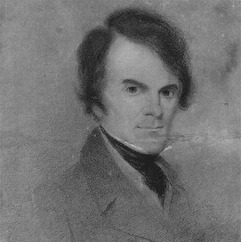 In 1815 Johnston has studied engraving as an apprentice of successful Philadelphia engraver Francis Kearney, and became himself an engraver of original caricatures, which were too controversial for publishing. In 1821 he switched to a theatrical career, appearing for the first time at the Walnut street theatre on 10 March 1821, as Henry in "Speed the Plow." He performed for five seasons with theatre companies in Philadelphia and Boston. Afterward he retired from the stage and set up an engraver's office in Boston. His most important early work, was a series of etched and lithographed character portraits of well-known American and British actors. In years between 1828 and 1849 he published nine numbers of his annual comic "Scraps," made of five plates, each containing nine or ten separate humorous sketches.